By entering this event, you agree to the following DISCLOSURE: Rider agrees to become familiar with and abide by the rules of this event. 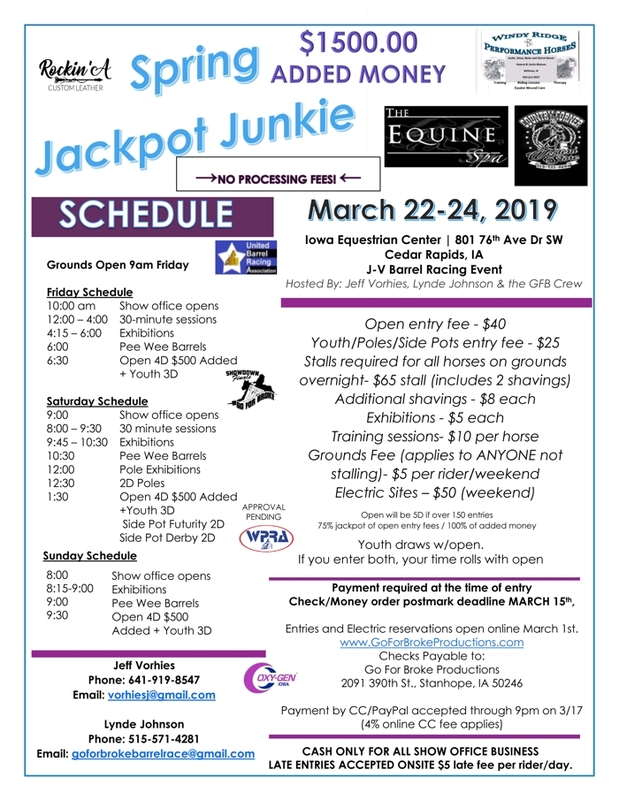 Rider understands that producers of this event, along with the staff and associates of Go For Broke Productions (GFBP)or J-V Barrel Racing are not responsible for accident, injury, theft or death to themselves or property while attending, competing, camping or spectating at this event. Rider understands that producer reserves the right to refuse entry for any reason. WARNING: Under Iowa Law, a domesticated animal professional is not liable for damages suffered by, an injury to or the death of a participant resulting from the inherent risks of domesticated animal activities, pursuant of Iowa Code Chapter 673. You are assuming inherent risks of participating in this domesticated animal activity.